Last week we took a look at aspartame, a popular nonnutritive sweetener that’s been around for a long time and is found in a “little blue packet.” It’s interesting to hear and read about people’s reactions to and opinions about sweeteners. Some people won’t touch them with a 10-foot pole, while other people find them to be helpful to include in their diets. The good news, I suppose, is that there are many different types of sweeteners (caloric and non-caloric alike) to choose from. This week, we’ll look at another very popular sweetener called sucralose. Not surprisingly, sucralose is a very different type of sweetener than aspartame. This sweetener, which is 600 times sweeter than regular sugar, is actually made from sugar. For you chemistry buffs, sucralose is made by replacing three hydrogen-oxygen groups on a sucrose molecule with three chlorine atoms. These chlorine atoms help to create a structure that is very stable. Sucralose was discovered in 1976 and was approved for general use in 1999. Sucralose is found in over 4500 foods and beverages. Unlike aspartame, which breaks down at high temperatures, sucralose is approved for cooking and baking. It’s heat stable and it’s sold in granular form, just like sugar. Many people prefer the taste of sucralose over other sweeteners, claiming that it tastes more like sugar and without an aftertaste. 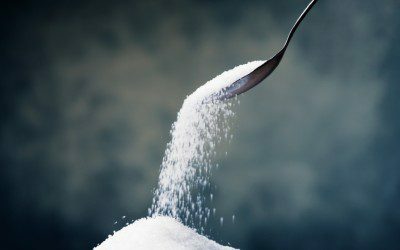 What are the concerns about consuming sucralose? Like aspartame, sucralose has undergone extensive safety testing. Studies conducted over a 20-year period have determined that sucralose is safe for the general population, including children, and pregnant and breast-feeding women. It’s a good choice for people who have diabetes as it does not impact blood sugar levels (although keep in mind that foods containing nonnutritive sweeteners, such as yogurt and ice cream, still contain carbohydrate and will affect blood sugar levels). The Center for Science in the Public Interest (CSPI), the consumer action group that came down on aspartame, has different thoughts about sucralose’s safety, however. For a long time, they rated sucralose as being “safe,” but after the release of an Italian study that claimed sucralose caused leukemia in mice, they’ve downgraded and placed it in the “caution” category. CSPI said they were waiting for the Italian study’s review to decide what longer-term rating to give sucralose, but this study has not yet been published. A review published in the Journal of Toxicology and Environmental Health, Part B: Critical Reviews has raised other concerns about sucralose. One of these has to do with the effect of this sweetener’s effect on the good bacteria (probiotics) in the gut; sucralose may alter the amount and quality of these good bacteria which, in turn, may be associated with weight gain and obesity. The study’s authors also claim that sucralose may affect insulin and blood sugar levels, is linked with inflammatory bowel diseas,e and may even alter genes. Note, though, that the research reported in this review was done on rats, not humans, so it’s important not to panic. Hopefully more research will be conducted in these areas so that we can learn more about sucralose and its effects on health, if any. What also has some people worried is the chlorine found in sucralose. Chlorine, which you probably think of as something you dump into your pool, is actually found in some of the foods we eat, including vegetables, bread, and meat. When sucralose is made, the chlorine atoms bind to carbon, producing chlorocarbons. But again, more than 100 scientific studies have been done on sucralose, many of which used extremely high doses of sucralose (far greater than one would ever consume) to ascertain its safety. If you recall from last week, the FDA sets a safety level for all sweeteners called the Acceptable Daily Intake, or ADI. The ADI for sucralose is 5 milligrams per kilogram of body weight per day. You would need to consume 165 packets of sucralose to reach this amount. Once again, the choice to use sucralose (or not) is up to you. If you feel worried about possible side effects, choose another sweetener or talk it over with your doctor or dietitian who can help you make the decision that’s best for you. More on sweeteners next week!